At William Maslin Dance Studios, group classes are an important part of your individualised dance program. Our Sydney CBD group dance classes provide a fun, relaxed and friendly environment to learn to dance. 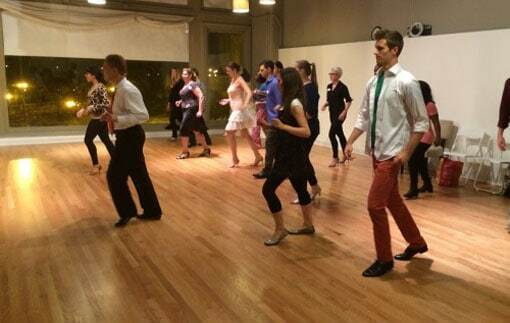 We run group classes for each level, so you will be dancing with other students at the same level as you. Plus, you will be working on material that complements your individualised program. Not working on a personalised dance program already? No problems. We also run DanceXpress group classes, which are 4 class short courses in a single style of dance. Checkout the DanceXpress page to learn more! Why join our group dance classes? In our group classes, your dance teacher will focus on patterns, footwork, timing and other aspects of dance. You will also learn how to navigate the dance floor with ease, so busting your new moves on a crowded dance floor won’t be daunting at all! Our group classes are a great opportunity to practise your dancing while having one of our dance teachers keep an eye you. They are also great for learning how to dance with a range of different people, meaning you’ll be ready to dance with anyone. At William Maslin it’s easy to find a class to suit you. Throughout the week we offer a wide range of group classes, including ballroom, Salsa and Rumba. Our studio also offers private classes, as well as yoga and Pilates. Whether you have been thinking about learning a new dance style or are an experienced dancer who has had a break and wants to get back into dance, we welcome you to try the group dance classes on offer at William Maslin. Our nurturing teachers will be there every step of the way to guide you. We offer a fun and supportive environment for our students to ensure you have a positive experience at our studio and will want to bring your family and friends along to dance too!